This Creamy Herb & Goat Cheese Mashed Potatoes recipe takes ordinary mashed potatoes to soaring new heights with the simple addition of goat cheese, basil and thyme. A flavorful, crowd-pleasing side dish that is delightfully simple to make. Mashed potatoes are pure comfort food and a favorite side dish for almost any occasion. In this recipe, goat cheese gives a luxurious, creamy tang, while basil and thyme give an additional layer of flavor that elevates regular mashed potatoes to a whole new level of deliciousness. For the fluffiest, smoothest mashed potatoes, I recommend using higher starch potatoes, such as Russets (used in this recipe) or Yukon golds. They require less mashing to become creamy and also absorb flavorings more easily than waxy red potatoes. Always put the potatoes in cold salted water to start, then heat to boiling and reduce to a simmer. Doing this helps the potatoes to cook uniformly. If you start in hot water, they will cook unevenly, with the outside falling apart before the inside is cooked. Be sure to not overwork your potatoes when you are mashing them. Mashing your potatoes for too long or too vigorously (like in the food processor) releases a lot of starch, which can make them gluey and unpleasant to eat. This Creamy Herb & Goat Cheese Mashed Potatoes recipe takes ordinary mashed potatoes to soaring new heights with the simple addition of goat cheese, basil and thyme. Place potatoes in a large pot of cold, salted water. Bring to a boil over high heat, then reduce heat to low and simmer for 15 - 20 minutes or until potatoes are fork-tender. Drain the water from the potatoes and return to pot. Add milk, goat cheese, butter, salt, basil and thyme. Mash with a potato masher until smooth. Thanks Heather! ♡ Ooo cream cheese would be so good with mashed potatoes! It would definitely add a similar tangy flavor and creaminess as goat cheese! OH WOW it looks so creamy and delicious.I love mashed potatoes but have always just mashed it with a bit of butter and sometimes chives. This sounds like an amazing idea…definitely trying this next time I prepare mashed potatoes. Thanks so much Ashika!! 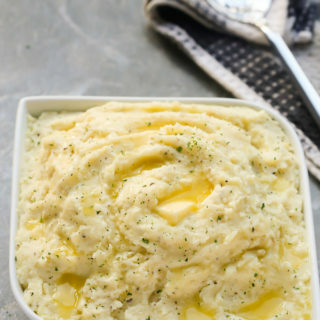 ♡ You should definitely try this recipe the next time you make mashed potatoes for a bit of a change! 🙂 You’re very welcome my dear! Oh my gosh. I love goat cheese and mashed potatoes. This is a sinfully good combination. I literally cannot wait to try them!! That butter on top?? Gahh, this is calling my name!! I love the idea of adding goat cheese to mashed potatoes!! I am sure it takes them to another level of creaminess!! Thanks for the tip on soaking them in cold salt water first..I am going to try this next time to see the difference :).